2. 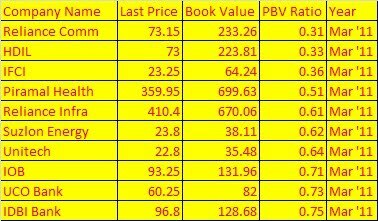 PUNJAB AND SIND BANK is a 10 rupee face value stock with a book value of 161.55 so in terms of book value it is a value buy if you buy it in SIP with Patience and do not worry if price is falling 20-50% from here. 3.promoters holding 82.07% in PUNJAB AND SIND BANK . 4.PUNJAB AND SIND BANK year high 149 and year ow 64 currant price is 68.35 near his year low. 5. in short term my view is negative but in view of more than 3 year i will be positive but recommended BANK BEES instead of particular bank. WHERE TO GET INFORMATION ABOUT STOCKS??? I have been regularly following your blog. I have couple of questions regarding the analysis part. 1. Where do you find the book value of a company. Is there any website which provides this value? 1. OH, Ravi you ask my secret point! suppose if i disclose my source of information than who is like to visit my blog? 2.do not worry point no 1 is just a joke...i always like to educate investors and make them independent so today i disclose that how i collect information about a stock. site for getting most of information like face value of stock , promoters holding , FII holding and dividend history price history, news bulk deals etc. 4. but book value of stock not available in above link so i use google to get book value , just type book value of....(your company name) in google search box and look the results. 5.for debt/equity ratio i use dalal street monthly magazine where data base of most of companies is provided in some pages otherwise visit company site to locate balance sheet. 6. than i get a conclusion on base of face value book value promoters holding price history debt/equity ratio and my experience. 7. in this blog post you see an image of apple which i bought last year and happy to see it shape like to lord ganesha. THIS MONTH START A SIP IN Reliance Infra. Every third Sunday of month we recommended a fundamental undervalued stock for making a 12 months SIP of 1000 rupee per month. i think after one year we have invested 12000 in this particular script , than we again hold it for a target 15 % to 100 % profit as market situation. we already make a 1000 rupee per month SIP in reliance com , HDIL , IFCI , and piramal heath care in last months so this month we consider Reliance Infra as fundamental buying. I'M REGULAR READER OF YOUR BLOG AND I ALWAYS FALLOW YOUR INSTRUCTION. IN LAST FEW MONTHS I PURCHASE FUNDAMENTALLY STRONG SHARE WHICH YOU SUGGEST. THANKS FOR SUCH A WONDERFUL JOB FOR US. NOW I WANT TO INVEST RS. 20000/- FOR INCOME TAX PURPOSE IN INFRASTRUCTURE BOND (80CCF). 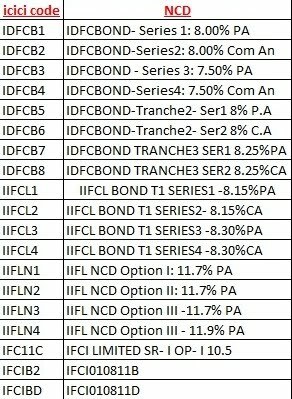 PLEASE SUGGEST ME WHICH INFRASTRUCTURE BOND IS BETTER OR ALL BONDS OFFER BY DIFFERENT COMPANY ARE SAME. I WAIT FOR FOR YOUR REPLY. 1. manoj ji Infrastructure bonds are offered by infrastructure finance companies like ifci L&T IDBI etc , with prior approval of Govt. Of India. our govt want to promote the infrastructure growth so govt have offered investors tax benefit max up to Rs.20,000/-. 2. Capital raised under these issue is used in infrastructure development projects like projects of National Highways,power plant projects like thermal, hydroelectric power plants and other infrastructure projects. 3. so investors of these bonds get tax relief in 80 ccf , so if you cross your maximum limit of 100000 than you consider these bond for extra 20,000 investment. 4. i think LIC infrastructure bond is best option in these bond second choice is IDFC infra bonds but all of these bond in near about same nature and same in return so choose more reputable company like LIC or IDFC. 5. i have no any infra bonds and i am not a registered advisor for these type of investment. Thanks for running this wonderful blog. 1) Recently IFCI floated tier 3 bonds at ROI of 10.75% for deposit over 5 lakhs for 10 years. I couldn't buy it from primary market, how can I buy it from secondary market via ICIC Direct. 1. Salim ji , for buying NCD or icici , ifci , idbi bonds through your icici direct account first login to your account. 2. 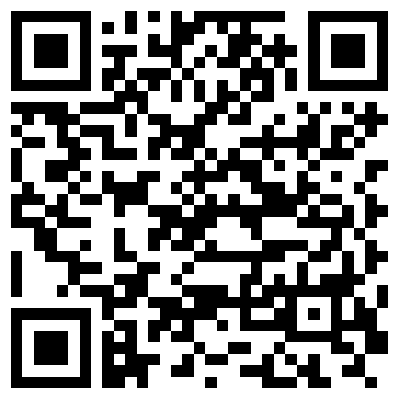 Go to trading -equity- stock list page. 3. Leave stock name blank select product “All” select exchange “ BSE” because most of NCD trade only at BSE than click on view tab. 4. It will open a list of 3388 stocks , ETF and NCD which traded at BSE through icici direct. 5. Choose your wanted NCD and click buy button for buying, some of NCD have only sell button so you cannot buy these through icici direct. This s surya ur regular blog reader.I just wanted to know if commodities prices like crude oil prices gets decreasing will it affects the growth prospects of company like selon exploration?? ?Pls suggest ur views sir! 1.SELAN EXPLORATION TECHNOLOGY LTD is a 10 rupee face value stock. 2. SELAN EXPLORATION TECHNOLOGY LTD is recently give dividend so my view is negative for this stock, as you knew my formula is " after recent bonus and stock spilt one stock may under perform the market for coming 2-3 years. 4. promoters holding in SELAN EXPLORATION TECHNOLOGY LTD is 42.02 % and book value of SELAN EXPLORATION TECHNOLOGY LTD is 99.84 only. 5.i think increasing commodity price may not effect exploration companies but my view is negative for this stock due to recent bonus activity and low book value. 6. i have no any stock of SELAN EXPLORATION TECHNOLOGY LTD.
1. KSK Energy Venture ltd is a 10 rupee face value energy company. 2. Book value of KSK Energy Venture ltd is 69.24 so CMP 103 is still high from book value but it is normal because power and software company generally known as low book value but high EPS companies. 3. EPS of KSK Energy Venture ltd is also low 0.30 in DEC 10 and -0.36 in sept 10 , in June 2011 KSK Energy venture ltd EPS is -2.05 and company is now turn in to loss making company so this is a concern. 4. KSK Energy Venture ltd promoter holding 52.73 FII holding 9.97 % ( they reduce it from 13.32 % ) so promoter holdings pattern is good. 6. KSK Energy Ventures Ltd has announce the light up of the boiler and completion of steam blowing with respect to the third unit (135 MW) of the 540 MW Wardha Warora Project (4 X 135 MW). 7. so overall my view is negative for KSK Energy Venture ltd .
8. i have no any share of KSK Energy Venture ltd.
BUY FIRST SOURCE , KAMDHENU ISPAT , INFRA BEES , MTNL , REL COM ETC. Thanks for your efforts and dedication towards this wonderful blog. I was reading your old pages come across many good recommendations like arvind ltd etc. but i had found this good blog recently could not able to buy your recommended good stocks. i want to invest for long term may be few for 5 to 6 yrs and few for another 10yrs. it would be grate if you could suggest such good and potential stocks which can be multibaggers in long run in future. like arvind ltd which you mentioned in many posts. 1. Sudheer ji , FIRST SOURCE SOLUTION LTD is my top multi bagger pick for this time i think one could making a 1000 rupee per month SIP in first source ltd for multibagger ltd like arvind ltd , the power of this method is tested with my self. 2. i tell you my true story i make a 1000 per month SIP in arivnd ltd for 5 year at SEPT 2005 when arvind ltd is traded @140 , after making my SIP it will be down and down but my confidence for my stock is not down and i will continue with my 5 year plan i see price of @12 also, so overall i invested 60,000 in 5 year and bought 1632 stock of ARVIND LTD , now my ARVIND LTD portfolio value is 175000. and i still hold ARVIND LTD.
7. my personal interest is included in all of these stocks, read disclaimer on this blog before investing.